Hello again! I this mini-series (of in-determined length) will I try as best as I can to recreate great visualizations in tidyverse. The recreation may be exact in terms of data, or using data of a similar style. (see article for moving picture) We see a animated flow chart that follow the style of the classical Sankey chart. This chart will be the goal in this blog post, with 2 changes for brevity. firstly will I use randomly simulated data for my visualization and secondly will I not include the counters on the right-hand side of the chart and only show the creation of the counter on the left-hand as they are created in much the same fashion. First we need some packages, but very few of those. Simply using tidyverse and gganimate for animation. We will start with animating a single point first. The path of each point closely resembles a sigmoid curve. I have used those in past visualizations, namely Visualizing trigrams with the Tidyverse. here the data is fairly clean and tidy, with numerical values for from and to but this endpoint should be able to be achieved in most any other appropriate type of data. 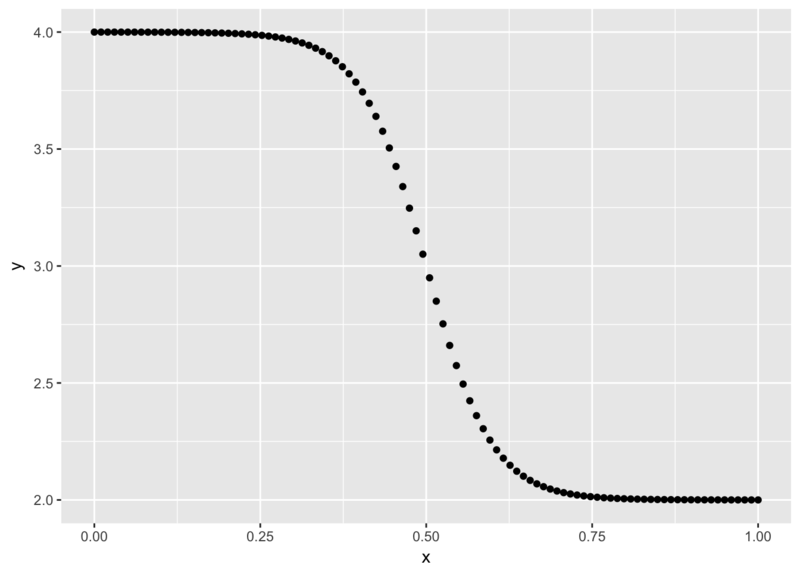 To simulate the path of a single data point we will use the custom sigmoid on the data for a single row. This gives us this smooth curve of points that resembles the path taken by the points in the original visualization. To set this in motion we will employ gganimate, for this we will add a time column to act as the frame. Which looks very nice so far. Next step is to have multiple points flowing towards different locations. To account for the multiple points we will wrap everything from last section inside a map_df to iterate over the rows. To avoid over plotting we introduce some uniform noise to each point. Everything looks good so far, however the points all look the same, so we will do a little bit of beautification now rather then later. In addition to that will we save the data for the different components in different objects. the following point_data have the modification with bind_cols that binds the information from the data data.frame to the final object. We include the color and removing all themes and guides. Which already looks way better. Next up to include animated counter on the left hand side that indicates how many points that have been introduced in the animation. This is simply done by counting how many have started their paths and afterwards padding to fill the length of the animation. This is added to our plot by the use of geom_text with a new data argument. We did some stringr magic to have a little annotation appear instead of the number itself. Important to have the hjust = 0 such that the annotation doesn’t move around too much. Like the original illustration there are some boxes where the points “land” in. these are very easily replicated. This will be done a little more programmatic such that it adapts to multiple outputs. We will add this in the same way as before, this time we will use geom_path to draw the box and frame = min(point_data$time) and cumulative = TRUE to have the boxes appear at the first frame and stay there forever. Lastly do we want to fill the boxes as the points approach them. This is done by first figuring out when they appear at the end of their paths, and them drawing boxes at those points, this is done by the end_points and end_lines respectively. Like before we add the data in a new geom_, with cumulative = TRUE to let the “points” stay. And this is what I have for you for now. Counters on the right hand side could be done in much the same way as we have seen here, but wouldn’t add much value to showcase that here.